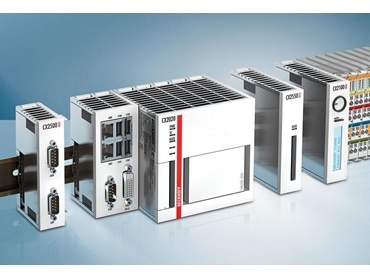 BECKHOFF Automation presents the new CX2000 series modular embedded PCs, the second generation of the original embedded PC family introduced to the market in 2002. Multi-core processors are a highlight of the new CX2030 and CX2040 embedded PCs, enabling the embedded controllers to cover performance areas previously reserved for larger, cabinet-mounted industrial PCs. An internal extension bus based on PCI Express connects the system interfaces with the full bandwidth of a PCI Express lane. The CX2000 embedded PCs are equipped with Intel processors from the second generation of the 32-nm series (Sandy Bridge). Fanless models are available with power-saving Celeron processors. The embedded PCs’ operating systems benefit from the fast, integrated graphic core as well as faster DDR3 memory. Similar to the first generation, Beckhoff offers the new CX2000 devices as individual components that the user can order separately and assemble in the field, simply by plugging them together. The CX2000 housing concept combines a metallic basic housing with front panels made of a special screening plastic.